China has announced new commercial flight routes that run extremely close to Taiwan. With China’s unexpected announcement on January 12 that four new flight routes running extremely close to Taiwan proper are to be launched on March 5, Beijing may have dispelled any lingering notion that relations across the Taiwan Strait in 2015 will continue to be as “stable” and predictable as they had been over the past six years of the China-friendly Ma Ying-jeou administration. Though sudden, this development is part of a series of signals that lead us to conclude that the era of détente in the Strait, during which Beijing and Taipei engaged in negotiations somewhat as equals, is over. We are now likely entering a period of Chinese unilateralism. During the six years since Ma became president in 2008 on a platform that emphasized the need to improve relations with China, the two sides of the Taiwan Strait made good use of the many semi-official bodies and Track-1.5/2 forums at their disposal to negotiate a number of agreements, chief among them the Economic Cooperation Framework Agreement (ECFA). Over time, those efforts were supplemented by party-to-party and, in some instances, contact between government officials from the two sides, such as face-to-face meetings between the Taiwan’s Mainland Affairs Council Minister and his counterpart at the Taiwan Affairs Office. In other words, there has been no lack of communication channels between Taiwan and China, and the opportunities to negotiate various agreements were seemingly limitless. Which makes China’s announcement on the air routes — M503, running on a north-south axis west of the centerline of the Taiwan Strait, and the east-west routes W121, W122 and W123 — rather alarming. Judging from Taipei’s reaction, Taiwanese authorities were either not consulted or negotiations on the matter had yet to have concluded. According to Bloomberg News, Taiwan and China had held two rounds of discussions to date. 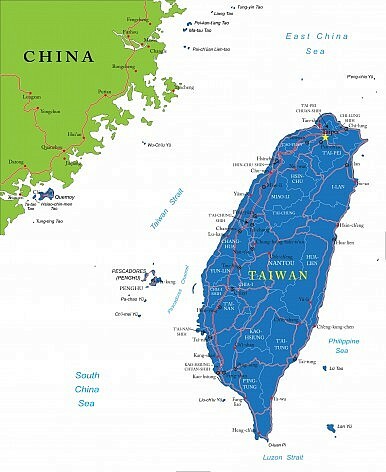 On January 13, Taiwan’s Civil Aeronautics Administration (CAA) said that M503, which at its nearest point is only 7.8 km from the centerline in the Strait, was too close to the Taipei Flight Information Region, an important air transport zone in the West Pacific. More than 140,000 international flights pass through Taiwanese airspace annually. The CAA also stated that the three other routes, W121, W122 and W123, risked interfering with air transportation between Taiwan proper and the outlying islands of Matsu and Kinmen. Taipei has called the announcement, done via the International Civil Aviation Organization (ICAO), the Montreal-based international organization that had no compunction in initially barring Taiwanese reporters access to its General Assembly in September 2013, stating its “one China” policy, was “hasty,” “unacceptable,” and a “flight safety risk.” The CAA has added it hopes that further negotiations will be held to resolve the matter. According to York Chen, a former member of Taiwan’s National Security Council, China had attempted to establish new flight routes near the Taiwan Strait in 2007, but abandoned the move following strong pressure from the United States. In some ways, the unilateral move is reminiscent of China’s declaration in late 2013 of an Air Defense Identification Zone (ADIZ) in the East China Sea, which overlapped with a section of Taiwan’s airspace. Although China’s ADIZ was ostensibly targeted primarily at Japan, with whom Beijing was engaged in a dispute over the Diaoyutai/Senkaku islets, the zone would nevertheless be a factor in any Taiwan military contingency as it would effectively cut off U.S. forces based in Japan and South Korea from Taiwan. Military implications notwithstanding, Taipei’s reaction to the ADIZ, including that of its armed forces, was relatively meek. Two factors help explain this reaction: (1) as we just saw, the ADIZ appeared to be aimed at Japan rather than Taiwan (a view that Beijing certainly emphasized); and (2) the context was different: Even in late 2013, when the identification zone was declared, the Ma administration still believed it had things under control and could continue negotiations on an equal footing with Beijing. The mood in the Taiwan Strait today is markedly different. While Ma, re-elected to a second term the previous year, appeared to Chinese officials in 2013 as “their man,” with whom they could continue to deepen, and perhaps accelerate, the momentum of liberalization in the Taiwan Strait, 2014 was a disastrous year for the Taiwanese leader, who has seen his ability to set the agenda much weakened. The Sunflower Movement’s three-week occupation of the Legislative Yuan, which stalled implementation of the Cross-Strait Services Trade Agreement (CSSTA) and a follow-on trade-in-goods agreement, followed by the abysmal showing of Ma’s Kuomintang (KMT) in the November 29 “nine-in-one” elections, had turned Ma into a sitting duck president. If Beijing cannot obtain what it wants through “peaceful means,” it will simply take. The period of tranquility created by Ma’s election was but an interregnum, convenient while it lasted, but not an end in itself for Beijing, which has not relinquished in the least its sovereignty and political claims to Taiwan. Many analysts have focused on the potential political calculations behind the meeting between Xi Jinping and Ma Ying-jeou. Time to look at the bigger picture.